→Can You Stay In Ketosis Forever? Is it safe to do it? Can You Stay In Ketosis Forever? Is it safe to do it? If you have already tried ketosis diet and are enjoying its benefits, you must be thinking of sticking to this diet forever. 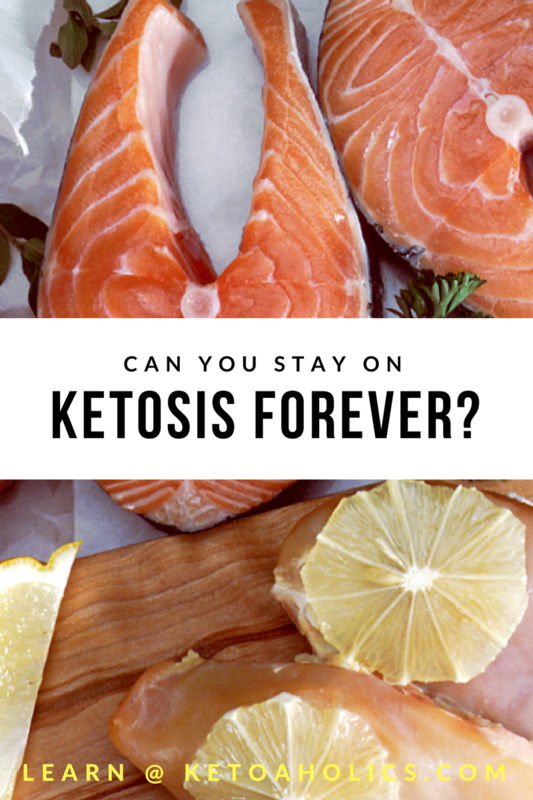 But, can you stay in ketosis forever? Will it continue to provide the same benefits or they will reduce over time? For how long you can stay in ketosis? These are a few questions that need to be addressed before you decide to stay in ketosis forever. Among these, safety is of prime concern. Let me answer all your queries about staying in ketosis forever. I will also provide some tips that will help you optimize the benefits of a ketogenic diet in a safe manner. But before this, let’s have a glimpse of what ketosis is. This information will help you understand for how long your body can keep working at its best after entering the state of ketosis. Ketosis is a natural state of a human body that occurs when it is fueled entirely by fats. You can get into ketosis by replacing carbs in your diet by foods containing healthy fats. Depriving your body of carbs through ketogenic diet forces your body to use fats as its source of fuel. This results in a considerable weight loss in a short duration of time. These are the basics about a ketogenic diet you must keep in mind while deciding can you stay in ketosis forever. Is It Safe to Do It? This is a big question that haunts most people relying on this diet to lose weight and stay fit. This diet can help them to maximize the fat loss. However, since this diet is completely devoid of carbohydrates, questions have been raised over its safety. This is a critical question as carbs offer a natural way for the body to get an instant source of energy. But, in the case of a ketogenic diet, this normal mechanism of the body is somewhat compromised with. It hacks of the body’s regular functionality. That might make it dangerous for you to stay in ketosis for too long! Continuing with a diet that’s fully devoid of carbs can alter the way body functions drastically. However, don’t feel disheartened. There are ways to stay in ketosis forever without causing any harm to your health. Let me reveal some secrets that will help you stay in ketosis forever. Every person can adapt to using ketones for fuel in a different way. In this process of ketosis adaptation, the energy powerhouse of cells called mitochondria become more efficient and start replicating themselves. This increases the number of cells having the ability to utilize ketone bodies as their primary source of energy. This adaptation can allow your body to get into ketosis faster than when you started the ketogenic diet the first time. This means, the more keto-adapted your body is, the easier it can be for you to get into ketosis. This will allow you to increase your carbohydrates consumption slightly during the later course of your ketogenic diet. You can keto-adapt your body by following the strict ketogenic diet without any carbohydrates for at least 3 to 6 months. Once your body adapts to using ketones, you can include a small amount of carbs in your diet. This way, you will be able to enjoy the benefits of ketosis without depriving your body of carbohydrates that are essential to perform certain functions in your body. This is a safe way to stay in ketosis forever as it allows you to eat a small amount of carbs even as your body uses ketones for meeting its energy requirement. Exercises can be your ketone boosting tool. However, it can turn into your worst nightmare if not done in the right way, especially if you are planning to get into ketosis forever. If your goal is to get into ketosis faster, you can perform high-intensity exercises to deplete the glycogen stores in your body. You can couple them with low-impact exercises such as walking and jogging to encourage ketone burning. However, if you continue to perform high-intensity exercises, it might prove to be counterproductive as your body may have already used up all the carbs you had. This can overwhelm your body with stress, which in turn, can reduce the ketone production. If you want to stay into ketosis safely, you should perform a combination of high-intensity and low-impact exercises only in the initial period to burn both carbs and fats. Once you have entered ketosis successfully and adapted to this state, focus only on the low-impact exercises that burn ketone bodies. This will help you to maximize the benefits of ketone burning processes. Mental stress can increase the production of stress hormones such as cortisol in your body. Cortisol can stimulate the process of gluconeogenesis to raise the blood sugar levels, while decreasing the insulin sensitivity simultaneously. This combination of effects can cause a higher level of blood glucose to hang out in your blood for a longer period of time. This glucose can be used by your body as a source of energy. This can shut down your body’s need to produce more ketones to fulfill its energy requirement. You can avoid this effect of stress by practicing stress-busting techniques such as meditation and yoga. This will reduce stress and allow you to stay into ketosis forever. If you want to know can you stay in ketosis forever, you must follow these guidelines. This will help you to avoid the ill-effects caused by depriving the body of carbohydrates and help you to enjoy the benefits of ketosis for as long as you desire.